Following the end of the Berlin – Wrocław EC Wawel (early December 2014), Frankfurt(Oder) – Poznań RegionalExpress trains (end December 2014), we now have the news that Dresden – Wrocław RegionalExpress trains will cease at the end of February 2015. News of this cancellation can be found here in Polish (Google translated), and from the rail company here (Google translated). Currently it seems there are no plans to make things connect at Görlitz to allow passengers to change trains there – the Polish news story makes reference to passengers needing to take a bus instead. The reason given for the cancellation is inadequate funding on the Polish side. This leaves Poland – Germany rail connections in a very sorry state indeed, and Wrocław now has no rail connection at all with Germany. The southern part of the Poland – Germany border is especially badly served. Here is the situation at each rail border crossing, working north to south. Served by 8 RegionalExpress trains each way, each day. Two stops in Szczecin on the Polish side. 14km from the border to the terminus, Szczecin Glowny. Two RegionalExpress trains each way a day from Berlin Gesundbrunnen to Szczecin, and 6 more RegionalBahn trains on the Angermünde – Szczecin section. Two stops in Szczecin on the Polish side. 20km from the border to the terminus, Szczecin Glowny. The final EuroCity trains between Berlin and Szczecin ran in 2012, and EuroCity trains beyond Szczecin to Gdansk were cancelled in 2000. 16 RegionalBahn trains each day from Berlin Lichtenberg to Kostrzyn. However Kostrzyn is the only station on the route actually in Poland, and the station is a mere 2.6km from the border. This is essentially a German regional train. The only border now crossed by long distance services. There are 4 Berlin – Warszawa services each way each day, and 1 Berlin – Gdynia service (diverging from the Berlin – Warszawa line at Poznań). 1 of these trains each way each day becomes the EuroNight train that now starts in Oberhausen. In the 1990s the EuroNight to Warszawa started in Bruxelles, and until 2014 it started in Amsterdam. There is currently no passenger rail traffic on this route, crossing the border at Guben. The last passenger trains ran there in 2002. The border crossing previously used by the EC Wawel (Berlin – Wrocław), this route is now served by 2 Polish regional services each way, each day, that cross the border 1km into Germany to reach Forst, and Forst is the only station on the German side. 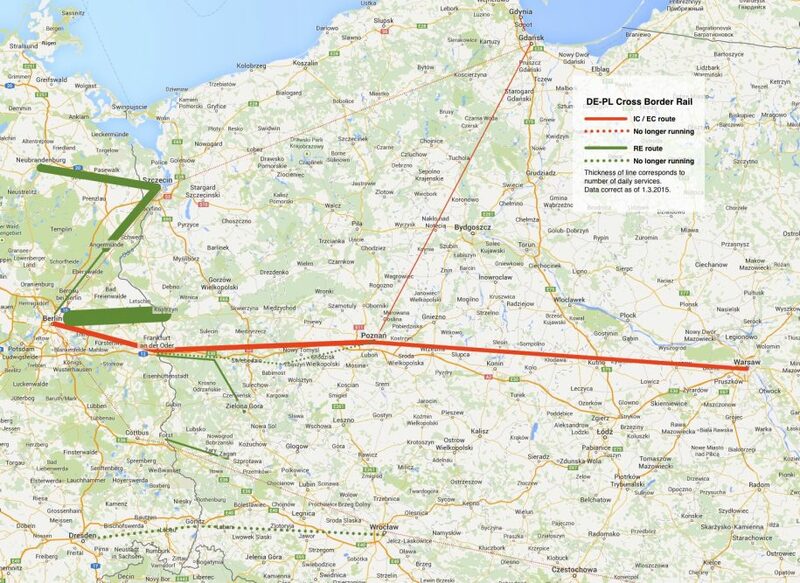 Anyone wishing to take the route of the old EC Wawel would now have to change in Cottbus, Forst and Zagan! Served by 3 RegionalExpress trains each way each day until the end of February 2015, then – according to current plans – by no passenger trains at all. Passengers will have to use a bus instead. Which leads us to the topic of buses… Deutsche Bahn currently runs one InterCity bus each day each way from Berlin to Wrocław, Katowice and Kraków, and from March will also introduce a limited Berlin – Szczecin service (route map here). With a new “Fernbus Offensive” planned by DB, this offer may increase. But when rail lines exist I’d very much prefer trains to run instead! The RZD Moscow-Paris train is very easy to book, and generally great value for inner-EU journeys. We used it just last week on a Berlin-Hannover journey where it’s cheaper than the ICE, just as fast, and far more comfy. In Issue 45 of hidden europe magazine, which is published on 12 March, we have a three page article on RZD’s excellent services within the EU on routes to and from France (viz. Nice and Paris). That article gives many sample fares. @hans – thanks! I wasn’t aware of that tip. I was trying to book in December 2014. I did it by ICE+TGV instead in the end, for €80 single. If booked more than 45 days ahead, Berlin-Paris should be approx. 120 Euro, Berlin-Warsaw 50 Euro. Otherwise it’s more like 130 vs. 55 Euro. @Boerrge / @Till – yes, that all sounds about right. I’ve only tried booking it Berlin-Paris and I couldn’t get that to work. There are some vague ideas to re-timetable the RZD train though, to make Berlin-Paris overnight, and hence be able to replace DB’s now cancelled CNL. Let’s see what happens when the new Talgo stock starts running on it. @Adrian – thanks! That graphic is fascinating as well, about Warsaw connections. Makes how the EU is constraining where PKP’s Pendolinos work look even more bizarre! It’s hardly surprising that they’ve decided to cut yet another connection. However, the RegioExpress between Frankfurt am Oder and Poznań are back… but on weekends only. (More info here: http://www.rynek-kolejowy.pl/55553/regioekspresy_poznan_frankfurt_wracaja_do_rozkladu.htm ) But the funding issue has still not been solved, so who knows how long are they going to remain in the timetable for. Now, you can see would people in Poland have to put up with: no money for this, no money for that. There is almost always no money to run quite a lot of public services and declared as not economically viable but when they get privitised, it can be sometimes seen that the private businessman is able to turn an unprofitable service into a feasible one. (The first graphic has a headline “Poland – cut off from the world in the rail sense” and then it shows the number of regular train pairs between the capitals featured (I think per day). The second graphic titled “Porównanie liczby pociągów do innych stolic” (“Comparison of the number of trains to other capitals”) is even more shocking. (Bar chart shows the number of trains per day and the pie chart features the population size of Warszawa, Praha and Bratislava in thousands of people). I think that all of this speaks for itself and the future can be easily imagined. I once tried to book a Basel-Warszawa ticket on the Russian ‘kurswagen’ to Moskva that existed until December 2013. It was possible to ask SBB to book it, but not instantaneously. I received a tender which included a TEE RailAlliance Geneva-Frankfurt/O full price ticket (with Swiss Halbtax reduction, but no special fare, which is usually applied on German night trains) (CHF 156.00) plus a Frankfurt/O-Warszawa ticket (CHF 36.00) plus a reservation Basel-Warszawa. The total fare was CHF 230.00 oneway and CHF 460.00 return, which I eventually rejected. By travelling on the same train, booking a ticket on the DB coach between Basel and Berlin and on a daytime coach between Berlin and Warszawa costed less than half as much, considered that the SparTicket applied. The fact is that RZD has no license to provide rail services within the EU (just from the EU to a third country). On lines where their coaches are trained by other operators, intra-EU links are handled by the respective national operators according to the ancestral UIC-CIV rules (without any commercial agreement foreseeing discounted fares, meaning that you always pay the highest fare). Such an option is only interesting if you book in the last minute, but you may not find any free seats. As far as I know, the Paris-Moscow line is operated by RZD without any agreement with other operators and it targets essentially Russian travelers. Hence, the cabotage within the EU is probably completely forbidden. At http://pass.rzd.ru/main-pass/public/en it looks like you can buy a ticket from Warzaw to Hannover but not to Berlin with RZD’s train from Moscow to Paris. I have no idea to how it works, though.